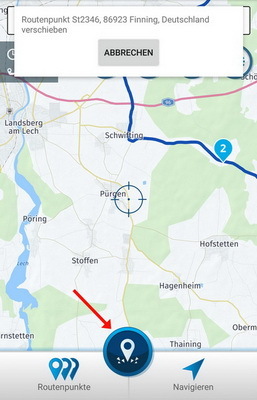 I’d love to see if waypoints will get their own context menu in the Kurviger app. With such a menu it could be even easier to move a waypoint (first click “move to”, then click on the new location), to delete it or to activate special (new) functions (like “choose as next nevigation waypoint”, “edit name” or “choose colour”). thanks for the suggestion. Have you seen our FAQ entry about moving waypoints? Other than that, we started creating such a contextmenu on the website . Let’s see what can be done in the app. Have you seen our FAQ entry about moving waypoints? Yes, I know that. But sometimes it would be easier to handle a “select a new location”-solution than a dragging-method (especially on a small display and when the new location is a somewhat farer away from it’s current position). 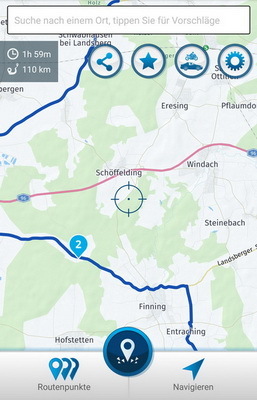 Maybe you want to take a look at the navigation app from MyRoute-app. Despite a lot of drawbacks this app has at the moment (Kurviger is definitely the better solution on the road), it’s route editor can be handled very comfortably. If you want, I can also provide some screenshots from this editor to demonstrate it’s workflow for moving waypoints. it’s route editor can be handled very comfortably. If you want, I can also provide some screenshots from this editor to demonstrate it’s workflow for moving waypoints. Sure, if that’s not too much hassle, it’s always interesting to see different options . Ok. I’m not at home this week, but you’ll get the screenies as soon as possible. Ok, here are the promised screenshots to demonstrate like another app (“MyRoute-app Navigation”) solved the workflow for moving waypoints. In my opinion this workflow is much easier to handle than being forced to hold a waypoint all the time to move it to a new position. Especially because you can freely move and zoom the map for selecting this new position. Very accurate and less risk to “loose” the waypoint while dragging like in the Kurviger app. 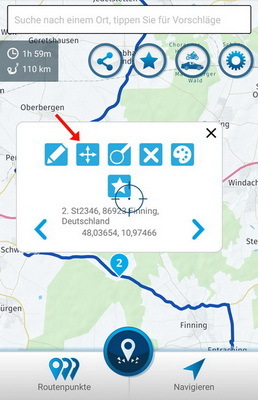 And it is much more comfortable to move the waypoint to a new position outside the map area currently displayed (in the Kurviger app it is somehow tricky to move the map while holding and dragging a waypoint). Maybe this could be a hint how to redesign the “move-workflow” in the Kurviger app some day. Probably if a context menu for waypoints will be introduced. By the way: although it looks like the MyRoute-app Navigation app has more or better functionality it fails in many vital functions and workflows if being used on the road. MyRoute-app has its own forum where many suggestions of the users had been posted - but the MyRoute team very seldom answered the questions or feedbacks. And a few days ago they even DELETED almost all those posts and discussions! In my opinion this is absolutely No-Go! This is completely different here and (in addition to the great functionality of the Kurviger app) one of the reasons why I switched from “MyRoute Navigation” to Kurviger. @SchlesiM thanks for the screenshots! Many users like to have a crosshair on their map so it just covers that need. In the future could be used for an alternative way to manage waypoints. Thanks for the explanation Mario and the detailed screenhots. Indeed a similar waypoint move process has been discussed for the Kurviger app as well (one reason for the crosshair in Kurviger). I think we discussed this in the old forum some time ago as well . It’s really interesting to see how others handle this .